If you're like me, you know that it's often difficult to find a time to get together with old friends... especially when you have more than two or three people. I have four wonderful college roommates and while we're all close, it's rare that we all together at the same time. So it was really a treat to spend some quality time together this past weekend in Milwaukee. We'd been talking about it for months and finally found a date that worked for everyone. Of course, we ate a lot! Talked a lot! And laughed a lot! Overall we had a great time and a lot of fun. Everyone wants to do it more often.We're planning on seeing a Brewers game this spring/summer and expanding the fun to include husbands too! We also made our weekend visit a bit educational. We visited the Body Worlds exhibit at the Milwaukee Public Museum. 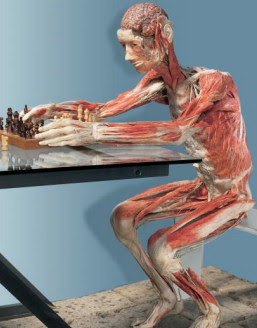 If you haven't heard about it, the exhibit features authentic human specimens preserved through a process called Plastination. This preservation technique replaces bodily fluids and fat with reactive plastics, thereby preserving human tissue in its natural state. It's an amazing look at the human body. It was especially interesting for my two roommates that are a doctor and a nurse to see the body in such a unique display. I was surprised that many of the bodies were not behind glass, but were right out in the open. On many of the bodies, you could get up close and personal to see the minute details. It was truly a remarkable show that left us talking about the amazing body and the controversial nature of the exhibit. 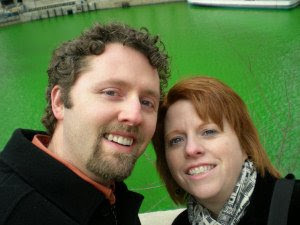 I was in Chicago this past weekend and got to witness the famous St. Patrick's Day tradition of dyeing the Chicago River green. Boy, when they say green, they aren't kidding! The river turns a beautiful shade of emerald green. Witnessing it for myself, I decided to learn a little bit more about the unique tradition. Here's what I found. First of all, they've been dyeing the river green for 40+ years. It's a privately funded operation by the Chicago Plumber's Union and the monumental task is pulled off by a group of volunteers. They head out in boats and dump 40 pounds of a vegetable-based dye into the river. The Chicago Journeymen Plumbers Local Union #110 sponsored the St. Patrick’s Day Parade in Chicago since 1957. In 1961, Stephen Bailey, the head of the local Plumber’s Union was approached by a fellow plumber wearing white coveralls that were covered with splotches of green coloring. The splotches were the result of the plumber using dye to locate a disconnect in a waste line emptying in the Chicago River. That’s how Bailey came up with the idea to dye the river green to celebrate St. Paddy’s Day and they’ve been doing it ever since. The dyeing takes place on the same day as Chicago’s St. Patrick’s Day Parade. The downtown parade is held every year on the Saturday before March 17. The dye is dumped into the river about 10:30 a.m. and the green color lasts for four or five hours. The magic of a Leprechaun? Believe it or not, the actual dye that is dumped in the river is orange in color, and it turns green when it hits the river. I think it's probably a little Leprechaun magic that turns it into the perfect emerald green color.